On Barack Obama’s official visit to Buckingham Palace last night, he handed over an iPod to the Queen as a gift, stuffed with video of her 2007 visit to the U.S. and a bunch of tracks from Broadway musicals including “Cats”, “South Pacific” and “Oklahoma!”. Not that impressive, really, is it? It wasn’t even engraved with the Royal Seal. She’s already got one, too – a 6GB iPod Mini, which Prince Andrew suggested she buy in 2005. 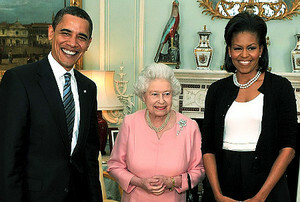 Her Maj was a little more classy – giving Obama her traditional gift of a framed photograph of herself and Prince Phillip. Visiting Google.co.uk today, you’ll see a particular celebrity adorning the logo – Queen Elizabeth II. Her Royal Highness is visiting Google UK today and, along with Prince Phillip, will be meeting staff, competition winners, and selected YouTube users. She’ll be shown demonstrations of Google’s technology, as well as meeting local schoolchildren who’ve been designing new Google logos.